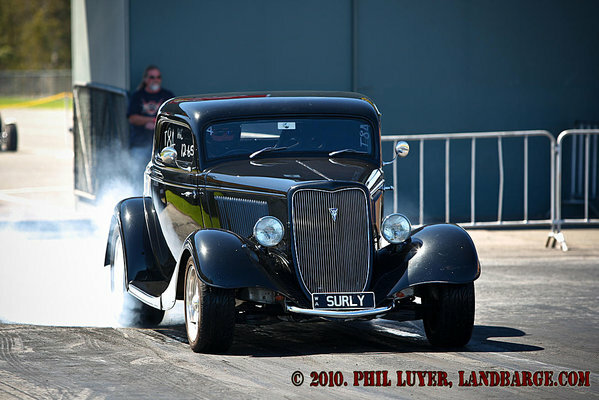 Sunday, October 24th, saw the first running of a new event at the Perth Motorplex, the Western Hot Rod Rumble. This event differs from other previous Nostalgia and Retro themed events in that it was exclusively for pre-1966 vehicles. 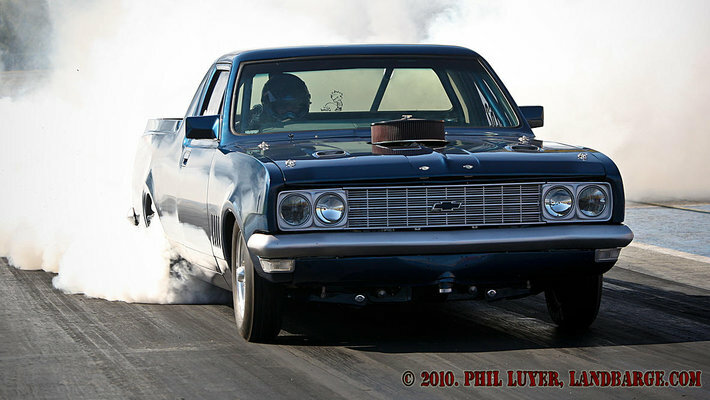 Other events in the past have accepted entries from vehicles up to the early 1980's in order to fill the staging lanes. 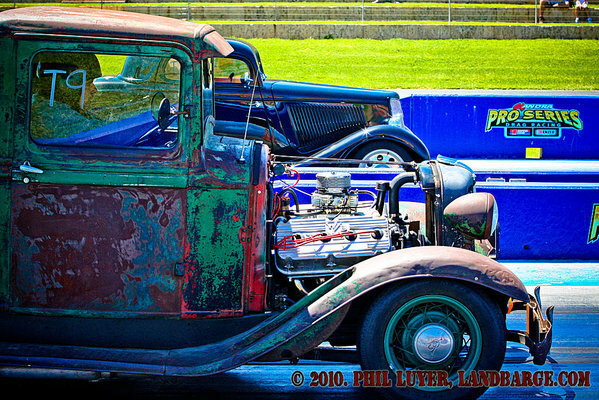 With the new cut off for vehicles, entries were down overall, but entries of hot rods appeared to be up on previous events. In addition to the 35 cars entered for racing for the day, at least another 50 eligible cars were parked in the pits, along with numerous classic cars that were within a couple of years of meeting the pre-1966 cut off for racing. During the break between qualifying and eliminations, all the steel bumpered cars in the pits were invited out for a cruise along the return road and back down the Motorplex drag strip, regardless of whether they met the year cut off to race. The Western Hot Rod Rumble was a really cool, laid back event, and one that I would love to see continue in a similar fashion for years to come. While it didn't have the huge entry numbers of some other events at the Perth Motorplex, the atmosphere around the place was one that could not be ignored. I am still sorting my photos from the day, but in the meantime, you can find a preview gallery of some of my photos from the Western Hot Rod Rumble over at LandBarge.com. Update: I've now finished sorting the full gallery of photos, and uploaded it here. 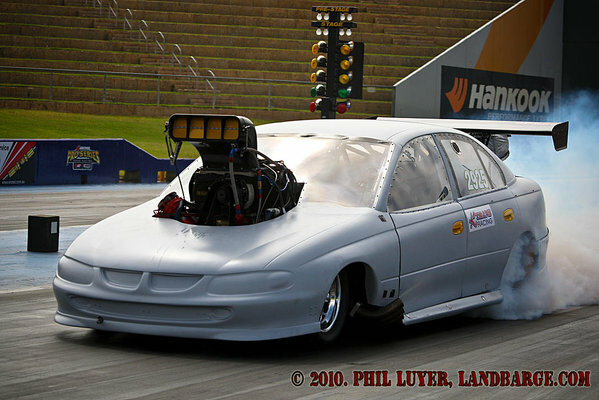 Over the last couple of weeks, I've had the privilege of attending 3 private track hires at the Perth Motorplex. These are events for a very small number of cars (usually 10 - 15 cars at the most), all ANDRA licensed cars and also usually full of very keen racers, as the cost of hiring the track for one of these days is around $6000. The first of these events I attended this season was organised by Maurice Brennan, a local Top Comp competitor, set on a path that will take him to Top Doorslammer competition when the time is right. Maurice had hired the track to test his Holden Commodore based Doorslammer, and to help keep the costs of the day down, he'd invited along a few other racers, including John Napier, in a new alcohol burning Funny Car, Rob Pilkington and Russell Ladbrook, also in Funny Cars, Rob Youngs, licensing a new altered and former Speedway racer Pino Priolo licensing his new Doorslammer, which will be running in Top Comp this season. While Maurice's day probably could have gone a little better, blowing the doors off his own race car on his second pass of the day, the rest of the day ran very well and all the racers present showed a lot of promise for the upcoming season. 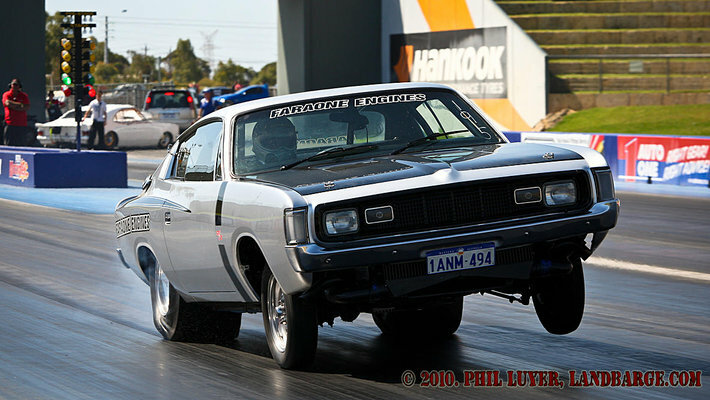 The following weekend, Kevin Hort had hired the track to test his Holden Monaro Super Sedan and also to give son Ethan some time behind the wheel of Kevin's previous drive, the Holden ute he'd previously campaigned in Super Sedan. Unfortunately, mechanical issues kept Kevin off the track on the day, but Ethan certainly made sure he had all the fun his dad was missing out on, running a best time of 10.23 seconds on his last pass of the day. The ute will now be backed down a little, in order to run Super Street legal times, and Ethan is planning on running a full season in Super Street this season. Other drivers present on the day included Paige Gavin, who was making progress towards her A/JD license, Steve Yozzi in his Supercharged Outlaw BMW, George Separovich in John Faraone's wild Charger, George Kontarinis in his turbocharged Camaro and Gail Rowles and Lisa Powell both making licensing passes in cars usually driven by their partners. Today's track hire was organised by Street Torque, from Maddington, who had hired the track on behalf of some of their customers. Spicing up the mix a little, were a number of regular National Open competitors including Dan Mitchell, Phil Purser, Adam Croker, Marty Dack and Matt Treasure. 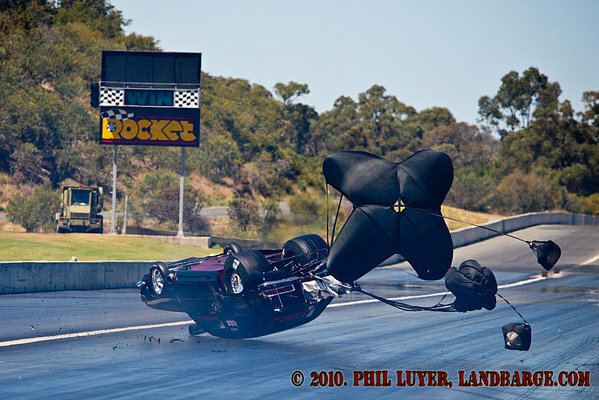 In an unfortunate twist, shortly after Phil Purser had completed his first pass after a roll over late last season, Dan Mitchell made contact with the right hand track wall, turned left and put the car on it's roof, before contacting the left side track wall and sliding most of the way to the finish line. After that rather unfortunate start to the day, things could only really pick up, and they certainly did that, with Matt Treasure taking to the track in Allan and Cheryl Greene's Greene Machine Nitro Funny Car. 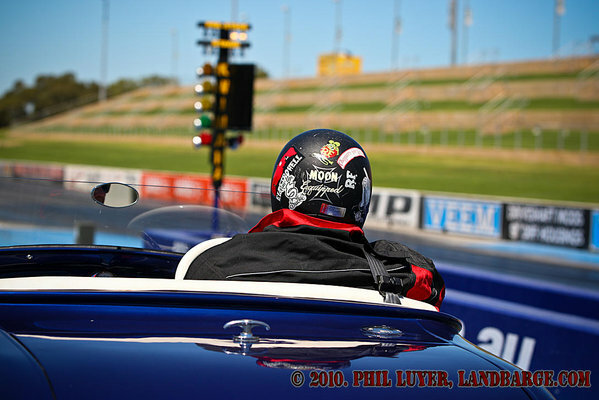 Matt has previous driving experience in blown alcohol Top Comp cars, including an angry altered and a very quick funny car, and took to the Nitro Funny Car experience like he'd been doing it all his career. After proving himself in the burnout and over the shorter distances as required by ANDRA, Matt was given the opportunity to make a full pass at the close of the test session, and he didn't disappoint with a 5.55 second pass setting him on his way to completing his licensing requirements tomorrow. 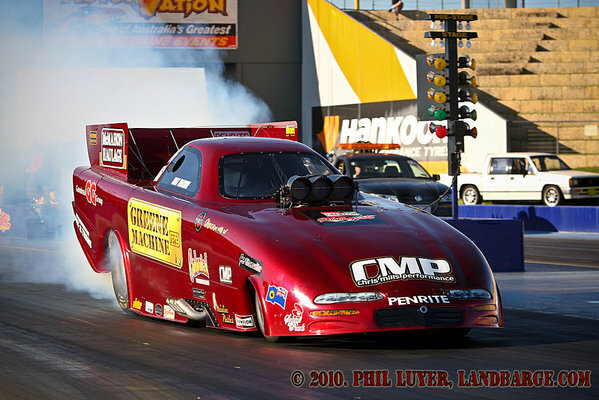 ANDRA requires that Nitro Funny Car drivers complete their licensing on two separate days, in order to prove their abilities with changing weather and track conditions, and the Greene Machine team have taken the opportunity to start their licensing at today's private hire and will attempt to complete their obligations at tomorrows public Test'n'Tune, again at the Perth Motorplex. Over 120 teams have nominated for the official pre-season test and tune, with several more expected to nominate tomorrow at the track. Entry is only $25 per adult, and the cars and bikes will be on track from 11am to 5pm.